The inevitable demise of humanity is really just a matter of when and how. Global warming, war, famine; there are any number of things that could do humanity in. In Infinite Dark #1 from Image Comics, humanity is on the brink of extinction, but fighting for survival. The issue is written by Ryan Cady, illustrated by Andrea Mutti, colored by K. Michael Russell and lettered by Troy Peteri. Cady's story is something of a survival horror, but in this case the horror being survived is the weight of responsibility. What's startling effective about the issue is how Cady allows the inhabitants of Orpheus to essentially commiserate with one another that the human race is dwindling and all they can really do is mandatory bi-weekly sessions to cope. There's very much a defeatist attitude about the story that the characters don't necessarily reflect in their actions. In fact, the entirety of the issue hinges on the premise of the first issue, one of the directors has absconded with someone else throwing the already dire situation into further turmoil. Cady paces the issue well too so that things build-up steadily and mysteriously. Mutti's art style is loose and detached throughout the issue. The rugged style works very well for the content of the book, as Mutti uses relatively simple pencils to render the characters on the space station. There's also an absence of detail in the settings and the Orpheus in general which affords the reader the atmosphere of emptiness pervasive throughout the issue. There's a sense of decay in the setting that Mutti blends rather effortlessly into the story in a way that reinforces the sense of despair. Russell's colors are pale throughout the issue, but work very well. 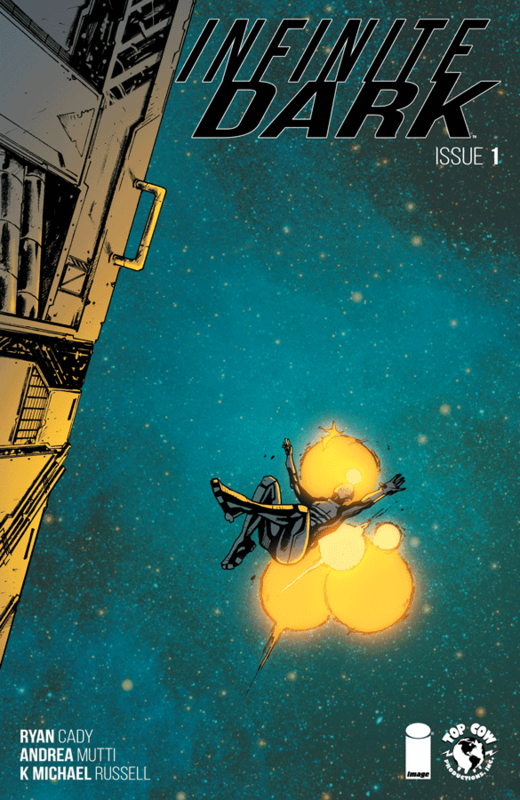 Infinite Dark #1 is a new take on space horror. Karrell is intent on keeping humanity alive despite its failings--both past and present. Cady could have made a big bad the enemy stalking the characters from the shadows, but the fact that he's instead relying on emotion to drive the fears is much more effective. Mutti has something of an incomplete feel in her artwork that's works exceptionally well for the issue, reinforcing the solitary atmosphere. 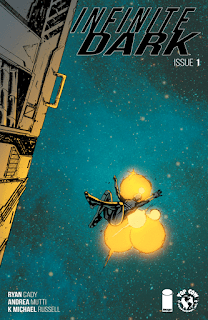 Infinite Dark #1 is a great new book to check out. Infinite Dark #1 is available now.